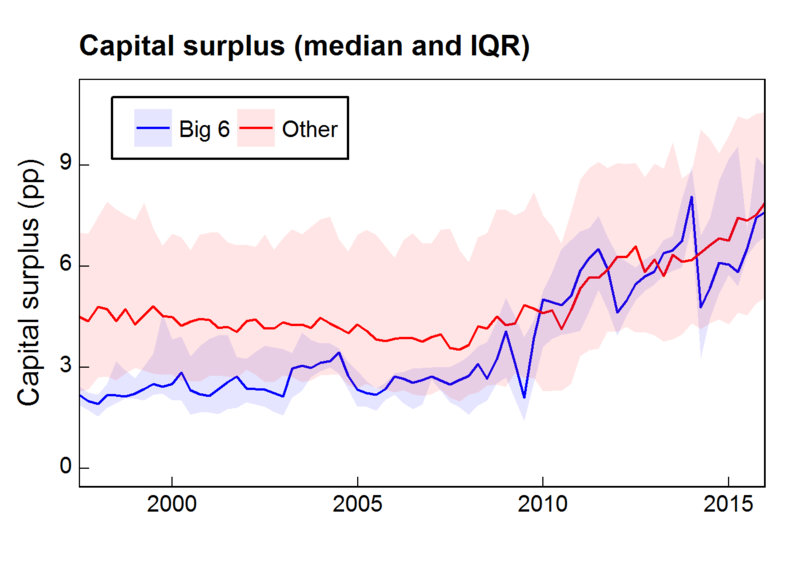 Before the financial crisis, the surplus was stable, with a median around 4.5 percentage points of risk-weighted assets. After the crisis, the median has risen steadily. Building capital ahead of increasing requirements is likely a major driver (Basel III is being phased in progressively, and won’t be fully in force until 2019). Interestingly, the so-called ‘big 6’ banks have gone from economising on their capital surplus relative to other banks and building societies to being broadly in line with the pack. The upshot is that, in the wake of the financial crisis, UK banks and building societies have become substantially more safe and sound than a simple calculation of new requirements plus the typical pre-crisis surplus would suggest. The question remains: where will the capital surplus settle once Basel III has been fully phased in? Watch out for a chart like this in 2020! Update 20/12/2016: The data used to generate the chart can be found here. Peter Eckley and Liam Kirwin work in the Bank’s Policy Implementation & Strategy Division. Previous Post The U Word: What can text analytics tell us about how far uncertainty has risen during 2016?